Clary Lake was completely ice-covered by late afternoon on Friday, November 23rd, just one day after Thanksgiving. This is the earliest ice-in date we’ve recorded since we started keeping track (check out the Ice-In and Ice-Out Dates page). The lake was mostly frozen over a few days earlier but for some large areas of open water; to qualify as “iced in” the lake has to be fully covered by ice. As a kid I recall ice skating on Thanksgiving, but that was more than 50 years ago; in recent years, ice-in has been more likely in mid-December. It remains to be seen if the lake remains ice-covered with the somewhat warmer weather we’re expecting this coming week. If you plan to venture out on it, please be careful! 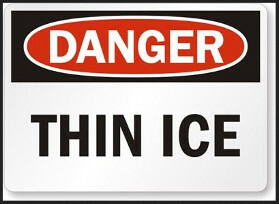 Some areas of ice will be plenty thick while other areas may be unsafe; warmer temperatures, and rainfall will not help the situation. Repairs to the Clary Lake dam have been on hold for a week; the combination of bitter cold temperatures and a high water level at the dam forced a temporary halt to the work and the PCS crew took the better part of Thanksgiving week off. With warmer weather forecast for this coming week and with water levels at the dam falling nicely, we’re hopeful that repairs can be completed in the next week or two before winter sets in with a vengeance. We’re hoping that today’s storm and the one due in next Tuesday won’t result in much precipitation. The final phase of dam repairs will consist of filling the 7′ wide hole in the dam with new concrete and installing a 5′ wide weir in the top. The weir will have slots on either side for stop logs which will be used to adjust the lake level. Historically, repairs to the Clary Lake dam have been facilitated by the construction of a temporary cofferdam between the old Narrow Gauge railroad abutments, but one side is now owned by Aquafortis Associates LLC and we have not received permission from Richard Smith (owner of Aquafortis) to construct a cofferdam there. Consequently we’ve made other plans. In any case, repairs will be completed, sooner or later. This entry was posted in Association News, Clary Lake Dam Repairs, Technical Lake Stuff. Bookmark the permalink.